HACU and Southwest Airlines will award roundtrip e-pass(es) to undergraduate and graduate students across the country who travel at least 200 miles from home to pursue a higher education and meet the eligibility criteria. An essay is required. Students selected receive e-pass(es) for use to travel between home and college or university. The 15th Annual, or "Quinceañera," of the ¡Lánzate!/Take Off! 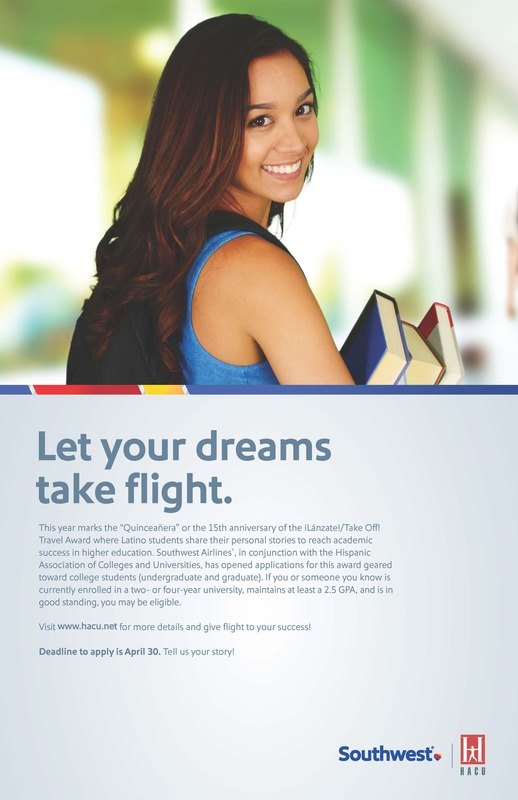 Higher Education Travel Award Program is sponsored by the Hispanic Association of Colleges and Universities (HACU) in conjunction with Southwest Airlines. Through this national education initiative, HACU and Southwest Airlines will award roundtrip e-pass(es) to currently enrolled undergraduate and graduate students across the country who travel away from home to pursue a higher education and meet the eligibility criteria listed below. A selection committee consisting of national education advocates and community leaders will select the award recipients. Recipients may be awarded 1-4 roundtrip e-pass(es) for the student to use when traveling to/from the college/university. The complimentary e-pass(es) can be used for travel to any of the Southwest Airlines destinations in the continental United States (void Alaska, Hawaii, Puerto Rico and where prohibited or restricted by law) as listed on www.southwest.com. Student must be enrolled in a college/university at least 200 miles from their permanent home. Student must be in good academic standing as determined by his or her college/university. Student must have a minimum 2.5 GPA. Student must be 18 years old or older at time of application. Recipient must be a legal U.S. resident. All federal government regulations related to air travel and Transportation Security Administration rules must be adhered to, including, but not limited to, producing a valid government issued photo ID for air travel. One application per student must be submitted online by the specified deadline of April 30, 2019 at 11:59 p.m. CT. Incomplete applications and applications not submitted online will be disqualified. Needed travel must be to/from Southwest Airlines domestic destinations. Students will be required to complete and upload an Enrollment Verification Form with their application. The Enrollment Verification Form must be signed by the college Registrar's Office and must verify enrollment and grade point average. All selected student recipients will be required to complete and sign an IRS Form W-9 with the student's full social security number. The student must identify direct or parental ties to a specific country to determine Hispanic origin on the application. Common inquiries can be found on our Frequently Asked Questions page. The student must write personal essays addressing questions as outlined in the application. The essays must be between 300 and 500 words demonstrating college level writing and grammar skills. Applications with essays with fewer than 300 words or more than 500 words will be disqualified. In the essays, the student should demonstrate or discuss socio-economic need such as financial need, cultural considerations, etc. The essays may be written in Spanish, provided an English translation is included with the application. Application deadline is April 30, 2019 at 11:59 CT. Your Enrollment Verification Form and must be completed, signed, and ready to upload. Please be sure your essays are 300-500 words. Applications not meeting requirements will not be considered. For scholarship essay writing tips, visit academictips.org. A selection committee comprised of national education advocates and HACU leaders will review all qualified applications and essays. Students attending a HACU member institution will receive additional consideration in the individual review phase. The decision of the selection committee is final. The selection committee will determine the number of students who will receive Southwest flight e-passes, with a minimum of 125 recipients. Also, the selection committee will the determine the number of Southwest flight e-passes each selected student will receive (between two to eight). HACU will send an auto reply e-mail acknowledging receipt of the application. No notification will be sent as to whether the application is complete or incomplete. By participating, students give permission to HACU to verify enrollment at his or her college. HACU will send an email communication to selected students by July 12, 2019 notifying each student of the selection committee awards. Each selected student recipient must acknowledge email communication to accept the award and return the completed IRS W-9 form by email by July 22, 2019. Students will receive the awarded number of flight e-passes from Southwest Airlines by August 15, 2019.